BELLEVUE, Wash. — (BUSINESS WIRE) — August 4, 2016 — Envelop VR, a software company enabling new ways to use virtual reality as a platform to work, create and play, introduces their initial product, Envelop™ for Windows®, the only fully immersive computing platform that enables all of your Windows applications while in a VR headset. No longer limited by a physical “flat” monitor set-up, Envelop for Windows is the best way to experience immersive computing by running any existing Windows application in a virtual environment. It bridges the past with the future, providing users for the first time ever individual control over each window’s size and location in a vast three-dimensional space. Users can open multiple windows, adjust them to any size, and place them wherever they want, improving multi-tasking capabilities and allowing for customization of a personal work space for improved productivity and efficiency while computing. Virtual reality users can now shop online, check social media, work in Microsoft Office and watch a YouTube video all at the same time. Envelop for Windows is the basis for a powerful, soon-to-be-released SDK (software development kit) that will enable developers to extend legacy two-dimensional applications and web sites, as well as new three-dimensional games and applications into the immersive computing platform. 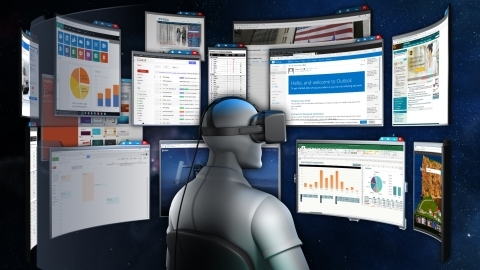 This means Envelop software will help produce a much greater virtual reality ecosystem. Virtual reality users wanting access to more intriguing content will want to make sure to download and use Envelop, and developers wanting a toolkit that will simplify creating new VR content or enable them to easily “VR-ify” legacy content will also need access to the software. The software also comes with several custom-designed environments allowing users to change the backdrop scene and personalize the virtual space depending on their mood. For maximum performance, Envelop requires a Windows 10 operating system and a VR-ready graphics processing unit, e.g. Nvidia GeForce GTX 970 or AMD Radeon™ R9 290 equivalent or better. Founded in 2014, Envelop VR is a virtual reality software company that enables enterprises, developers and consumers to work, create and play in an immersive, 3D virtual environment. Envelop VR is the brainchild of serial entrepreneur Bob Berry, who studied virtual reality in Japan in the late 90s, and chief technology officer Jon Mavor, who has spent the last two decades in the video game business developing advanced rendering technologies. Envelop VR is based in downtown Bellevue, WA. For more information, go to www.envelopvr.com or email us at info@envelopvr.com.